Since the late arrival of spring, the Municipal District of Taber public works department has been incredibly busy with a variety of different projects. The flooding in the spring pushed back much of their regular scheduled work but public works staff have been making the best of things and have been vigilant in catching up to where they need to be. “We have made significant progress on a lot of stuff we are working on currently,” said Jeremy Wickson, director of public works at the M.D’s regular meeting on August 28. The flooding caused hundreds of M.D. roads to close down but over the past few months, most of those roadways are back up and running. Two miles north of the Oldman River are the last remaining closures in the M.D. of Taber. “We have two miles in M.D. boundary that still needs to be opened up but outside of that, gravel roadways are open for harvest,” said Wickson. With the number of roads closed due to the flooding, staff were able to re-open the majority of the roads by the time summer came around. Leaning on past experiences with flooding and road closures played a part in how quickly staff were able to get the roads opened back up to the public. “We had the vast majority of our roads opened by the end of July except for that two miles. The contract was awarded end of June, beginning of July so we did make a substantial recovery process. A lot of that is attributed to past road projects and past drainage infrastructure that had been repaired,” explained Wickson. Culvert work remains to take up a bunch of public works’ time as well. The overland flooding didn’t help things as some projects had to be pushed back in order to clear up the flooding concerns. Even with the amount of culvert work ahead of the staff, Wickson is confident the work will be completed in an appropriate amount of time. “We definitely have a lot of work to do within an asset portion but it is manageable essentially for where we are at right now,” he said to council. There were 465 sites with recorded damage, 58 damaged culverts, 78 new culvert installations and 424 roads damaged due to washouts and erosion, with all 424 roads completed. Damaged culvert work began in May and is expected to be complete sometime in November as 38 out of 58 are completed, according to the public works report. M.D. construction crews are still busy with a few different projects across the M.D. including the campus site. “As far as the main construction crew, we’re finishing up on the M.D. campus site. Then we’re essentially looking to get into our road projects which we initially planned on May or June to get started and now we’re getting to them in September,” continued Wickson. Construction on three miles of Range Road 13-1 from Highway 3 to Township Road 10-0 is expected to start on September 10 and be completed sometime in November. Meanwhile, projects at Range Road 19-0 from Township Road 10-2 to 10-4 (two miles) and Range Road 16-0 from Township Road 11-4 to 11-2 don’t have set start dates. 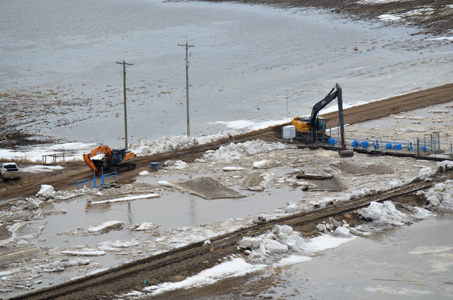 Flooding also had a major impact on the gravel crew as they didn’t begin their regular work until May. With the delay in starting, Wickson says they will be running as late into the season as they can. On the gravel schedule for 2018 is 105 miles south of M.D. gravel haul from Reti Pit, 55 miles south M.D. gravel haul from Owens Pit, 20 miles south M.D. gravel haul from Forks Pit, 60 miles north M.D. gravel haul from Snake Pit and 58 miles north M.D. gravel haul from Speaker Pit. Wickson also explained that the 400 miles are just a rough estimate for each year. The crusher crew was also slightly behind and Wickson said that was due to a crusher lead operator retiring. All 2018 capital purchases have been completed and Brewin asked to see an equipment summary for their machinery moving forward.